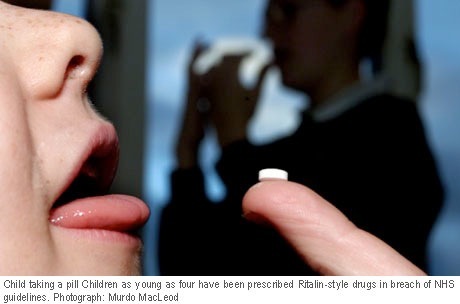 Children as young as four are being given Ritalin-style medication for behavioural problems in breach of NHS guidelines, the Guardian has discovered, prompting the leading psychological society to call for a national review. Family-based therapy is recommended for treating children with ADHD (attention deficit hyperactivity disorder), with prescription drugs used only for children over six years old and as a last resort. The figures, based on data from 479 GPs, show prescription rates were highest for children aged six to 12, doubling to just over eight per 1,000 in the five years up to 2008. Children aged 13 to 17 had the second highest rate at six per 1,000, while those aged 25 and over had less than one per 1,000. Concern is greatest over children under six who should not be receiving drugs at all, says the National Institute for Health and Clinical Excellence (Nice). There are no reliable figures for how many children under six have been given Ritalin. But Professor Tim Kendall, joint director of the National Collaborating Centre for Mental Health, who chaired the Nice guideline committee, confirmed that he had heard reliable reports of children in nursery and pre-school being prescribed medication unnecessarily, and that it was often parents who were putting pressure on GPs. He said: "There are two reasons why parents go shopping for a diagnosis. The first is to improve their child's performance at school, and the second is to get access to benefits. There are always GPs that will do it, but it's wrong to give a child a diagnosis without also consulting schools and teachers." In one case seen by the Guardian, a five-year-old from the West Midlands was found to be receiving a double dose of methylphenidate, commonly known by the brand name Ritalin, the drug used to treat ADHD, despite his school insisting that he is "among the best-behaved children in his class". In notes seen by the leading educational psychologist in the case, the boy's headteacher reports that the school does not believe he has ADHD, but that the medication is being prescribed "to help mum at home". In another case in the West Midlands a five-year-old was put on the drugs for three years at the request of his parents without any consultation with teachers or psychologists. Kendall said prescriptions could continue to rise due to impending health cuts. "It's a false economy … all the evidence says that parent training courses combined with partnership working with schools is what works, but these programmes are being cut by local councils." Speaking on behalf of the British Psychological Society, Peter Kinderman, chair of the division of clinical psychology, said he supported calls for a review, saying he would be concerned if children were being prescribed medication as a quick fix. He added that mental health services were already "grossly under-resourced" and that cuts were likely to put services to children at risk. Kinderman expressed particular worries about the cases uncovered by the Guardian. "Many psychologists are very concerned at the use of psychiatric and medical diagnoses in cases such as mild social anxiety or shyness, not only because of doubts about the validity of many of the diagnostic approaches, but because of the possible adverse effects." But Dinah Jayson, consultant child and adolescent psychiatrist at Trafford general hospital and a spokesperson for the Royal College of Psychiatrists, insisted that in some cases it could be "cruel" not to treat children of any age if all other options had been exhausted. She said: "With every child there is a risk of doing something but there is also a risk of doing nothing. We know early [medical] intervention can help children who would otherwise be losing out." Professor Ian Wong, director at the Centre for Paediatric and Pharmacy Research, who led the prescriptions research, pointed out that prescription rates were still below the expected number of diagnoses for hyper-kinetic disorders. "GPs and psychiatrists are much more aware of mental illness, and the drugs are so effective and have such a big effect that it's tipped the balance. They [drugs] can make a real difference not just to the child but to households and classrooms where children may be causing real disruption." According to Nice guidelines, between 1% and 9% of young people in the UK now have some form of ADHD, depending on the criteria used. NHS figures show a rise in all methylphenidate prescriptions across all age groups by almost 60% in five years, rising from 389,200 in 2005 to 610,200 in 2009. Side-effects include sleeplessness, appetite loss and reduced growth rates. Wong, who says the long-term effects are inconclusive, recently received a €3m (£2.6m) grant from the European commission to investigate side-effects further. Professor Paul Cooper, a psychologist and professor of education based at Leicester University, who has completed qualitative research with adolescents on psychostimulant medication, expressed concerns about the possible effects of the drugs on personality development. "Some young people say that it affects their personality but accept it because it gets mum and dad off their case or stops them getting into trouble," he said. "They don't like it, but take it for the benefit of other people." Medical experts in the West Midlands say over-prescription continues to be a problem. "This whole area needs public scrutiny – there has to be some kind of review," said the educational psychologist who oversaw the cases but did not want to be named. "Handing out strong psychotropic drugs to children should be a last resort, but they're being handed out like sweets." Listed below are links to blogs that reference this entry: Behaviour drugs given to four-year-olds prompt calls for inquiry. This page contains a single entry by Toni published on March 23, 2011 1:09 PM. Drug Giant Accused Of Bribing Doctors To Prescribe was the previous entry in this blog. Are Your Meds Robbing Your Body Of Key Nutrients? is the next entry in this blog.